Arizona Native Status: Introduced. 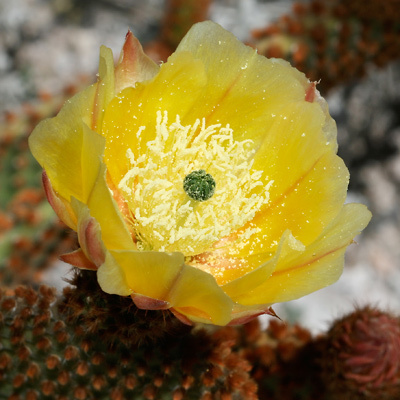 This naturalized ornamental cactus is native to northern Mexico. It is commonly cultivated here and can sometimes be found growing wild near towns and cities. Description: The flowers are up to 2 inches (5 cm) across and have broad, yellow tepals (petals and petal-like sepals), yellow anthers, and dark green stigma lobes. The flowers are followed by round to egg-shaped, red to purplish, spineless but glochid-dotted fruits. 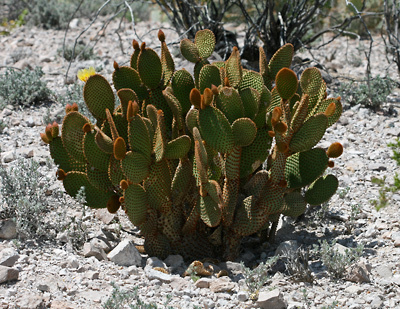 The stems are green, erect to sprawling, and segmented into numerous thin, flat, round to egg-shaped pads. 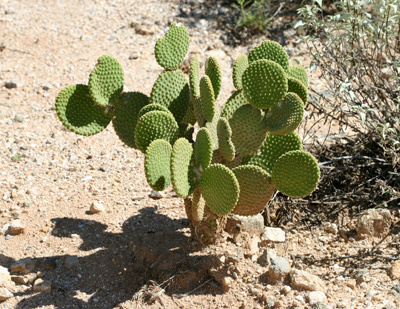 The stem pads lack regular spines but are polka-dotted with yellow, white, or red-brown glochids (micro-spines) at each aureole. The flowers emerge from the top edges of the pads. 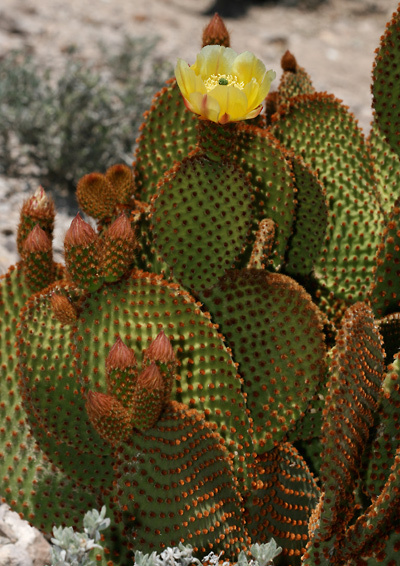 Stinging or Itching – The fuzzy looking polka dots on the plants are actually made up of tiny, very sharp spines known as glochids that can cause pain, severe irritation, and infection if embedded in the skin and can require medical attention if they get into a person's eyes, nose, mouth, or are inhaled. Because they are so tiny and fragile, glochids are difficult to remove with tweezers, but sticky tape can be used to remove them from skin.